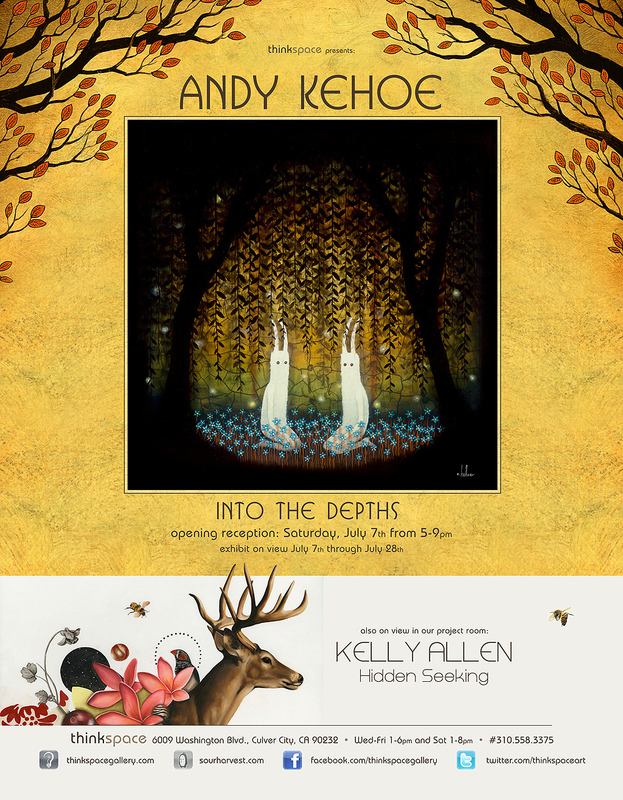 Andy Kehoe’s new body of work Into the Depths continues the artist’s very personally inflected exploration of memory and the personal imaginary. The work is thematically akin to fairytale, as Kehoe delves into an iconography that speaks of childhood fantasies and adult nightmares; of fears and of wants translated disproportionately into the adult’s psychic realm. The end result is an uneasy pairing of whimsy and ominousness. Kehoe uses the suggestion of narrative to imply a trajectory beyond the image plane. The viewer is left feeling as though they have had a glimpse into a much longer, and more significant vignette. Just as all effective suggestions of narrative leave one feeling the absence of its absolute resolution, we feel a mesmerizing pull to Kehoe’s narrative fragments, and wonder what else lies beneath the surface. The setting of the work is primarily arboreal: the fairytale’s stomping ground par excellence, and its characters vary from faceless amorphous specters, to giant seemingly sympathetic animals. A perfect combination of anthropomorphic creatures, and fantastical substitutions for the human, the fairy tale speaks of reality in the realm of shadow. Visually, Kehoe uses the dramatic devices of light and contrast to expound upon the emotional and atmospheric tensions the work seems to convey. Stark whites, and strategic areas of luminous color, are drawn out in contrast to pitch blacks, and obscure earth tones. Fine lines exist against solid blocks of color and areas of textured surface. The work is graphically compelling and visually seductive; combining an economy of line with a simplicity of palette. Materially, this new body of work marks a departure for Kehoe. Using a poured resin technique, in conjunction with his accustomed paint and ink application, the artist creates further accretions of depth. This use of layering suspends the imagery spatially and contributes to the work’s mystery, visual seduction, and complexity. As though we are looking into an ominously reflective surface that might just show us more of ourselves than we had thought, the added dimensional illusion of resin suspends our gaze. Andy Kehoe’s work is compelling, haunting, and magnetic. Into the Depths reminds us of the presence of shadows always lurking just beneath the surface. 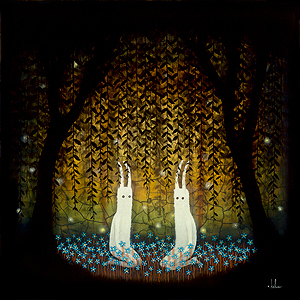 Andy Kehoe was born and raised in the city of steel, Pittsburgh, PA and lives there today. He was bred on comics, Saturday morning cartoons and story books from an early age and spent his days delving into these worlds of imagination. His paintings evoke this childlike innocence that recall a time when magic and monsters existed and all the untold mysteries of the world still seemed possible. Shortly after graduating from high school, Kehoe explored a number of different art schools before settling in to the illustration course at Parsons School of Design in NY. After dabbling in commercial illustration for a short time, Kehoe decided it was time to focus on his personal work, and he’s never looked back since.